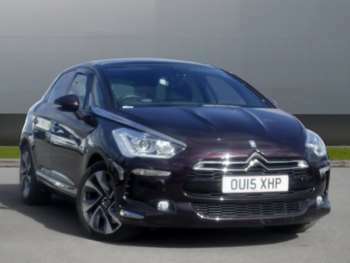 The DS5 models mark a return to Citroen’s individuality. It has a bold design with swoopy curves, featuring a prominent grille and LED running lights with chrome highlights running back to the windscreen. The interior is similarly stylish with an aircraft-like overhead console and a head-up display that projects essential information in the driver's line of sight. There's a choice of four engines, the THP 200 petrol, e-HDi 110 and 160 diesels and the innovative 200bhp Hybrid4 diesel-electric hybrid. All are available with 6-speed manual, automatic or semi-automatic EGS gearboxes. The e-HDi 110 Airdream has a stop/go system to cut emissions and fuel consumption in traffic. 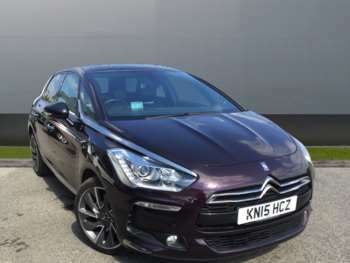 A used Citroen DS5 is undoubtedly different, with distinctive looks and some clever technology. There are three levels of trim, DSign, DStyle and DSport. Sport Signature and Dark Sport Signature packs became available in July 2012, which saw different alloys and lowered suspension added. These are standard on THP 200s but optional on the diesels. The e-HDi 160 will do the 0-60 sprint in 8.5 seconds but you should still be able to manage 50mpg if you treat it gently. Stability control plus side and curtain airbags help the DS5 to a 5-star NCAP safety rating. Build quality is good though with the interior having high-quality materials and feeling well screwed together. The car rides and handles well, though steering can feel lifeless which discourages enthusiastic driving. Diesels can feel a bit flat below 1,500rpm where the turbo kicks in. The hybrid is okay, but the diesel engine seems to cut in a bit too soon to take over from the batteries. It's worth noting too that this is a wide car – over six feet including mirrors – so it can be tricky to park and it may not fit all garages. For the most part, the driving experience doesn't quite live up to the image, but if you have a strong desire to be different then it makes an interesting used car choice.